Joseph Ratzinger, now Pope Benedict XVI, has been Dean of the College of Cardinals, Prefect of the Congregation for the Doctrine of the Faith, and President of the International Theological Commission. The Holy Father has also enjoyed a distinguished teaching career at such universities as Tubingen and Regensburg in his home country of Germany. On April 19, 2005, CARDINAL JOSEPH RATZINGER was elected POPE BENEDICT XVI and became the 264th successor to Peter as the "Vicar of Jesus Christ." He may well be the most accomplished theologian to be elected Pope in modern times. Beginning in 1981 he spent over 20 years as the Prefect of the Congregation for the Doctrine of the Faith, a role often depicted as the "defender of the faith." 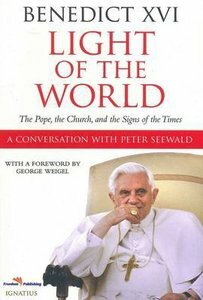 Cardinal Ratzinger was also President of the Pontifical Biblical Commission and of the Preparatory Commission that codified the new "Catechism of the Catholic Church," published in 1994. On April 19, 2005, Cardinal Joseph Ratzinger was elected Pope Benedict XVI and became the 264th successor to Peter as the 'Vicar of Jesus Christ'. He may well be the most accomplished theologian to be elected Pope in modern times. From 1981 he spent over twenty years as the Prefect of the Congregation for the Doctrine of the Faith, a role often depicted as the 'defender of the faith'. Cardinal Ratzinger was also President of the Pontifical Biblical Commission and of the Preparatory Commission that codified the new Catechism of the Catholic Church, published in 1994.In an unprecedented move he resigned as Pope on 28 February 2013.